I recently bought a Micro HappyModel F3 EVO Brushed flight controller on banggood. This is a really nice and small flight controller for brushed quadcopter builds as it features a powerful and future-proof STM32F3 CPU. A quick test with the betaflight configurator revealed it was delivered with Cleanflight 1.13.0 (Cleanflight/SPRACINGF3EVO 1.13.0 Jun 6 2016 / 00:03:29 (a77bc76)). As i run betaflight on all my quadcopters i want to run it on this target as well. 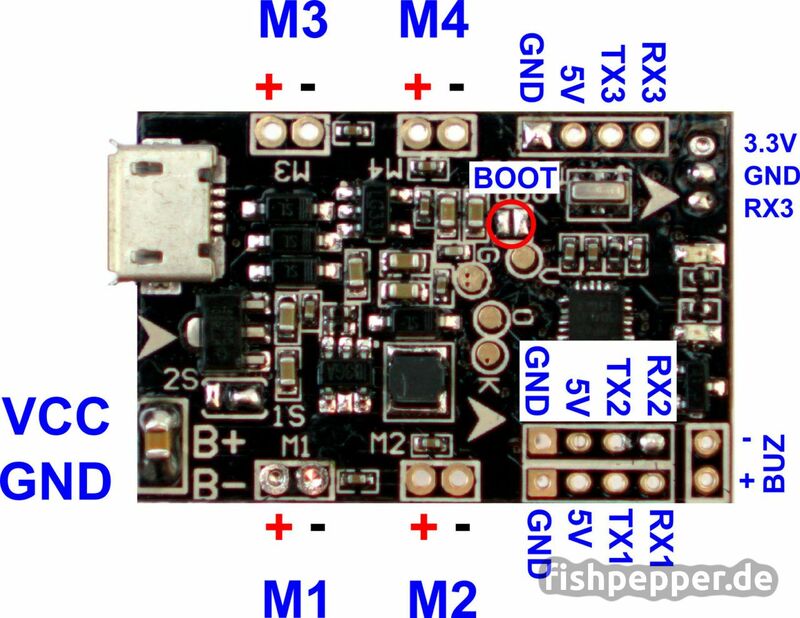 As flashing for F3 targets is a bit different here is a short tutorial how to upgrade this little board. In order to upgrade the firmware you have to short the boot pads on the PCB. They are on the USB side and are labeled BOOT. Get some small tweezers and short the pads while inserting the usb connector. Wait some seconds and remove the short. Found DFU: [0483:df11] ver=2200, devnum=59, cfg=1, intf=0, path="4-1", alt=1, name="@Option Bytes /0x1FFFF800/01*016 e", serial="206C354E2037"
Found DFU: [0483:df11] ver=2200, devnum=59, cfg=1, intf=0, path="4-1", alt=0, name="@Internal Flash /0x08000000/128*0002Kg", serial="206C354E2037"
This should download a 128KByte firmware image. The important parts are the memory address to load from (0x8000000 = FLASH memory) and how many bytes to load (128KBytes = 128*1024 = 131072). Now we can try to upload the betaflight firmware. We will use version 2.9.1. Please be patient and DO NOT interrupt this. It will take some time. 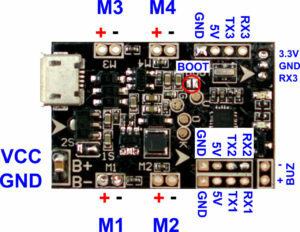 In case you interrupted it: don’t worry the usb bootloader is unbrickable, it is stored in the STM32 rom and can not be overwritten, just restart with the BOOT pins shorted. The board should reboot after flashing and enter the normal mode. Again, you should have a blinking board and a new USB device registered (VCP, virtual com port). Now fire up the betaflight configurator, select the right com port and hit connect.